For the past week, I’ve been relishing the spring weather in all it’s bounty. It’s been asparagus this and fresh strawberry that and I even managed to get in a game or two of badminton! However, when I looked into the fridge this evening, I was disappointed. It seemed that I had delved too quickly into my spring supply of produce that only winter vegetables were left, tucked into the nether regions of the vegetable drawer. Instead of making another hearty soup (groan! ), I spotted a lemon and set in motion plans to put a bit of spring into dinner. A stir-fry would be perfect for my needs and instead of making a heavy sweet n’ sour sauce to go with it, I whipped up a light n’ lemony sauce that was just perfect! I served the stir fry on top of plain ol’ spaghetti, but I’m sure brown rice would be an even lovelier accompaniment. As for the vegetables, you can use whatever you’ve got in your fridge which is exactly what I did. 1. In a measuring cup, whisk together the sauce ingredients and set aside. 2. Heat oil over high heat in wok. Add vegetables and toss until glistening. Add in a few shakes of soy sauce and keep stirring until vegetables are tender-crisp. Pour sauce over vegetables and stir until well coated. Cook for another minute and serve over rice or noodles. 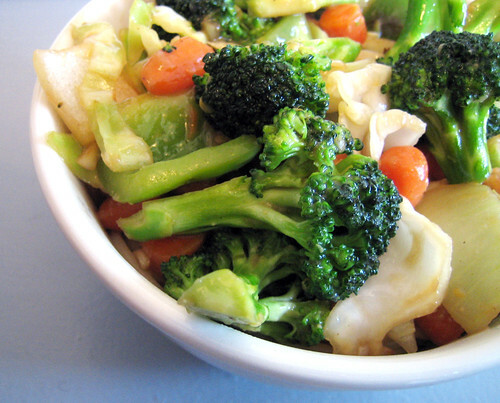 I love the idea of a lemony stirfry. Sounds good! I just made the lentil soup on Orangette’s blog last night – it was great, but did feel a little wintry for my mood! I have strawberries for tonight’s dessert though, so that should balance things out. Thank god you posted this. I’ve had a tub of miso in my fridge ever since I went to Mitsuwa and I haven’t even opened it yet. After spending 3 days in cold & snowy Ottawa I’m glad to be back in wet, wet, wet Toronto. Although it’s been a slow crawl into Spring over here, the early signs of seasonal change are becoming evident: iris’, crocus’ and tulips have sprung and are lining neighbourhood lawns. I’m also hankering for bountiful bowls of leafy greens and crisp, raw vegetables which would suit this lemon-miso sauce perfectly. I made this sauce as a gravy for pork chops and rice tonight. It was really good. The tanginess from the lemon juice and the peppery ginger went so well together. Miso rocks! I used red miso paste, which I already had, so my sauce was a dark brownish colour. But even so, the taste was so addictive I had to have a few spoons of the sauce on it’s own. Yum! i know rachel, i’ve been making stirfrys for years and never made one lemony! so good! maija, awww, that is a sweet sweet story! badminton is for lovers! haha. oh it sounds great! but i dont think i can ever find miso in here (only solution is to nag some japanese restaurants to give me some), do you have any replacement ideas? crafty chica, where do you live? if you can’t find a japanese grocer, any health food store should carry some in the refrigerated section. miso lasts forever so once you find some, it should last in your fridge for a long time! if you can’t find miso, you can sub in some tahini but it just won’t be the same thing.